Trump and First Lady Go to Texas. 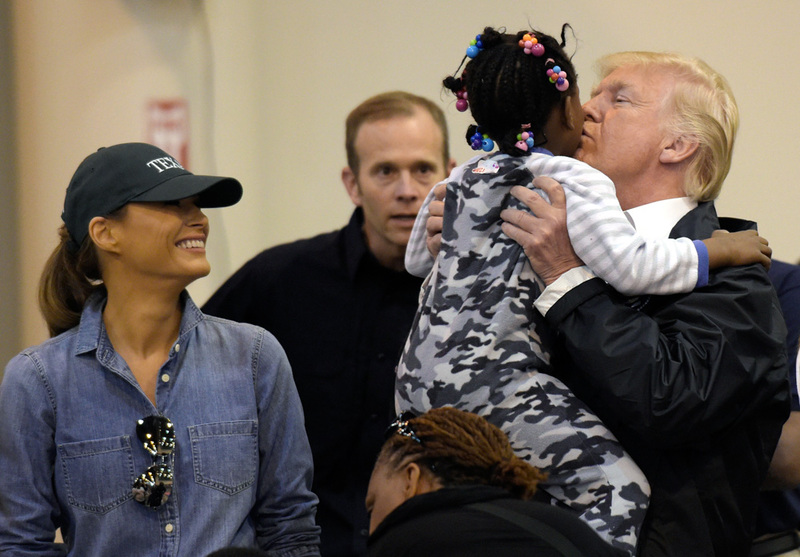 President Trump on Saturday returned to Texas to visit with Hurricane Harvey victims and talk up recovery efforts while warning it could take years to rebuild. The president, joined by Texas Gov. Greg Abbott, first lady Melania Trump and other officials, stopped at a church in the Houston area and acknowledged the recovery and rebuilding will likely be a “long-term” effort. “We have a long way to go, but the water is disappearing,” Trump told the crowd. The president said recovery efforts could take "two years, three years." The president on Saturday also visited NRG Stadium, the home of the Houston Texans, that has served as a recovery center for hurricane victims. Trump, speaking to reporters, praised the recovery efforts so far. “Really, I think people appreciate what’s been done,” he said. “It’s been done very efficiently, very well, and that’s what we want. We’re very happy with the way everything is going." The president handed out lunches of hot dogs, chips and apple sauce to people at the shelter. He was also seen giving hugs and playing with kids. "What are you building?" the president asked one child at a table full of toys. Before leaving Texas, the president stopped in a Houston neighborhood, where debris were piled outside ranch-style homes. Flooding has devastated parts of Houston. "These are people that have done a fantastic job holding it together," he said. At Ellington Field, where Air Force One awaited Trump to take him to Louisiana, the president greeted and praised members of the Coast Guard and Texas National Guard. He also briefly spoke with members of Texas’ congressional delegation, including Democratic Reps. Al Green and Sheila Jackson Lee, two lawmakers who have harshly criticized the president. Green has called for Trump’s impeachment and Lee has called the president incompetent. This is the president's second trip to the area. Earlier in the week, the president met with local officials and emergency responders on Tuesday in Corpus Christi and Austin. At the time, the White House suggested the president was keeping his distance from Houston so he wouldn’t interrupt local recovery efforts. As for federal aid, the president has urged Congress for roughly $7.9 billion, in the immediate aftermath of the storm, which hit the Texas Gulf Coast on Aug. 25 as a Category 4 hurricane. However, he now plans to ask for as much as $14.5 billion, according to the New York Times. Congress returns Tuesday from August recess, with assurances from Republican leaders of the GOP-controlled House and Senate that they will promptly start work on the president’s request. “As families & communities begin long recovery from Hurricane Harvey, House will act quickly on @POTUS request for emergency relief funding,” House Speaker Paul Ryan, R-Wis., tweeted Friday evening. And another top House Republican told Fox News within hours of Ryan's tweet that the chamber would begin such efforts when members return Tuesday. Senate Majority Leader Mitch McConnell, R-Ky., also vowed Friday to move fast on Trump’s request for federal assistance after Harvey, whose record 51-plus inches of rain flooded much of southwest Texas, including Corpus Christi, Houston and Beaumont. “Working closely with the President and the House of Representatives, the Senate stands ready to act quickly to provide this much-needed assistance to those impacted communities, and support first responders and volunteers,” the Kentucky Republican said in a statement. Congress didn’t approve funding for Hurricane Sandy until several months after the storm slammed the East Coast in October 2012, a delay that has been repeatedly revisited in the days after Harvey and one that Congress, particularly GOP members, appear eager to avoid this time. At least 47 people have died from the storm, and an estimated 72,000 have been rescued, according to reports. Trump’s initial funding request will be only a small part of the total amount likely needed from the federal government. Estimates of the amount needed exceed $50 billion, with flood evacuations continuing and cleanup expected to take years. The destruction from Harvey could rival or exceed the damage from Hurricane Katrina in 2005, which cost taxpayers $110 billion. The congressional efforts would begin with a separate appropriations bill that would send roughly $7.4 billion to the Federal Emergency Management Agency and $450 million to finance disaster loans for small businesses. Trump is scheduled to meet Tuesday with Ryan, McConnell and the Democratic leaders of the both congressional chambers -- Senate Minority Leader Chuck Schumer of New York, and House Minority Leader Nancy Pelosi of California. The Republican leaders are also making plans to use the aid package to win speedy approval of an increase in the federal borrowing limit. Congress also has to approve a federal spending package by Sept. 30 to avoid a government shutdown. Trump appears to be easing off his vow to shut down the government if money is not included to fundi his U.S.-Mexico border wall. Fox News’ Joseph Weber and Alex Pappas and The Associated Press contributed to this report.